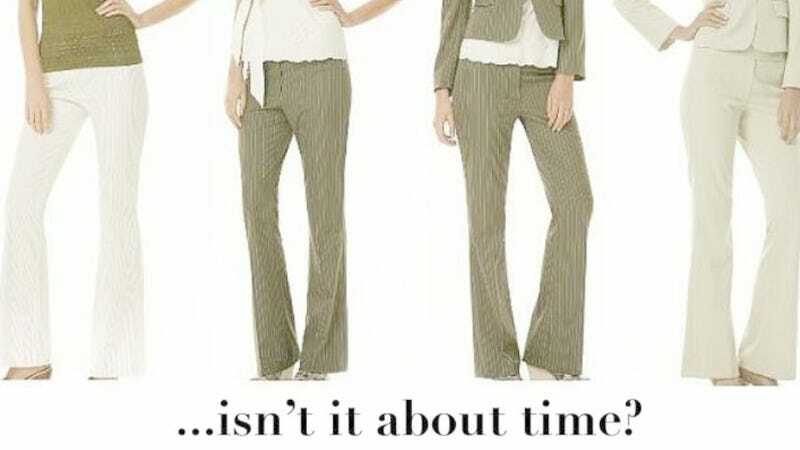 Mormon women are technically allowed to wear pants to church. But many who do say the whispers and judgmental stares that even their classiest slacks elicit thanks to cultural pressure to wear dresses or skirts illustrates the rampant gender inequality within the LDS Church. A new Mormon feminist group hopes to challenge the norm with next Sunday's controversial "Wear Pants to Church" event. We talked to the leaders about why their critics are so furious and why the Church needs more feminists to speak up. "Mormon women aren't equal, and that's a problem," Stephanie Lauritzen told us. She's the 26-year-old wife, mother, and part-time "professional" (HR won't let her talk about her job) who recently launched All Enlisted, the new feminist Mormon group behind Sunday's event. Lauritzen was raised by a Mormon feminist mother and said she felt disenfranchised from her religious community for years because she felt women were limited due to their gender. "But Mormonism is my cultural tradition," she said. "They're my people. And so are feminists. It's confusing to reconcile being a feminist in a patriarchal church, but we are trying to fight for it and make it better." Being heavily discouraged through diffuse social sanctions to wear pants to church is only the tip of the iceberg. Women cannot act in any church capacity without being supervised by a man. My oldest daughter, for example, attended our church's girls' camp for several days last summer, and my father, the bishop, had to spend some time at the camp as well. Not because his help was need, but because the grown women running the camp are supposed to be supervised by a male priesthood holder. My 60-plus-year-old mother had a man in his late twenties throw his jacket over her knees because she was sitting with them slightly apart while wearing a knee-length skirt. He believed she was being immodest. In addition to the larger structural inequity of women being excluded from most leadership positions and requiring the approval of a male superior regarding the decisions they do make in their limited callings, these smaller indignities are heaped upon Mormon women constantly and are both created and then reinforced by a religious culture that puts them on a pedestal by treating them like children. "As a woman, I completely feel equal to men, and feel no reason to challenge how things are, and have always been. I don't feel a need to prove that we are equal, and I think that if you feel we aren't, it's probably a personal problem, something you should see your bishop about. We women are the ones who are the backbone to almost anything that is accomplished these days, whether it be at church or home. We all know that. We are loved for our gratiousness and we are supposed to be distintly different in appearance than men. I, for one, am glad I'm a woman. I'd much rather wear skirts and dresses and pretty things..."
"If God wanted us to be equal, there would be either just men or just women on the earth. It would seem this is causing contention among the readers which is exactly what satan wants." "This event sounds like a little girl rebeling against her parents because she wants things done her way. Useless. If you feel that you have less rights thatn man in the Church, I say pray and study a little bit more, because you're missing a very important point: As special daughters of God you're different from men. That's nothing wrong with it"
"If you're wearing pants, it's because of something else in your own life that you don't feel equal about, not because of something in the church." Ladies: it's not the patriarchy. It's you. Why are so many people up in arms (or legs) about an event that's promoting an act that's officially A-Ok in the eyes of the Church? Lauritzen thinks it because some Mormons are scared to criticize any aspects of their faith because it implies that their entire way of living is wrong. "We love the things about being a woman that the Church loves too, like being a mom but we also want other opportunities," she said. "If we can't even do things that are allowed, like wearing pants, we clearly have a long ways to go." The women hope that the event will help All Enlisted gain more supporters so they can take even bigger steps towards equality in the future, as well as make Mormon feminists feel like they're not alone. Baptista said she's heard from multiple women who left the church due to gender inequality who are returning next Sunday so they can make a public stand by wearing slacks. "It's not about pants," Lauritzen said. "It's about broadening the cultural expectations about what it means to be a Mormon."